2019년 3월 6일부터 7일까지 강남 노보텔 호텔에서 열리고 있는 2019 OLED KOREA에서 CYNORA와 Kyulux가 각각 최신 청색 TADF 성능과 청색 hyperfluorescence의 성능을 공개했다. CYNORA의 chief marketing officer인 Andreas Haldi는 현재 CYNORA가 개발한 blue TADF emitter의 색좌표는 0.13, EQE는 20%, 수명(LT95@1,200nit)은 5시간이라 밝혔다. Andreas Haldi는 “CYNORA는 2018년부터 본격적으로 진한 청색 TADF를 개발하고 있으며, 청색 TADF 개발 후에 녹색과 적색 TADF를 개발할 것”이라고 언급했다. 한편, Kyulux의 CEO, Junji Adachi는 “청색 hyperfluorescence의 최대 EQE는 26%이며, 1,000nit에서의 EQE는 22%, 수명(LT95@750nit)은 100 시간이다”라고 밝혔다. 또한, Junji Adachi CEO는 청색 hyperfluorescence를 이용한 어플리케이션을 소개하며, 차세대 발광재료로 hyperfluorescence가 무궁무진한 가능성을 지니고 있다고 역설했다. [IMID 2018] Can Blue TADF and Hyperfluorescence meet both efficiency and lifetime? 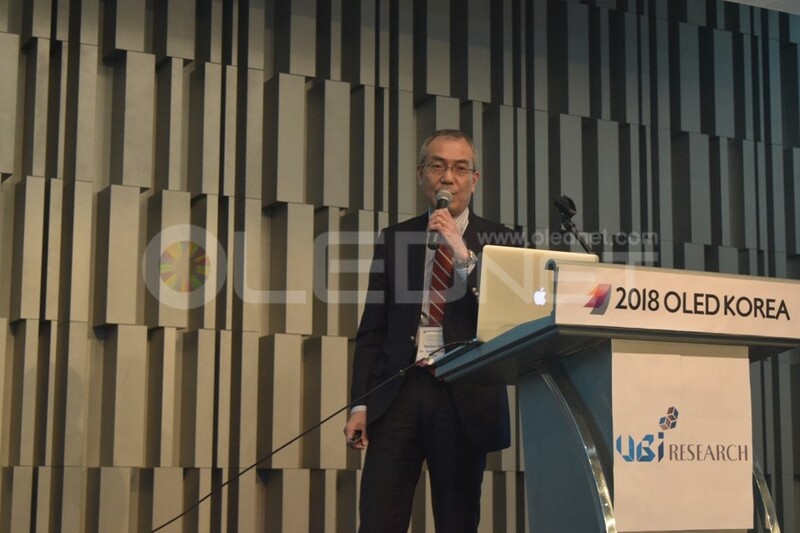 At IMID 2018 in Busan, BEXCO on August 31, Junji Adachi, CEO of Kyulux disclosed the performance of hyperfluorescence, which adds TADF dopant to the existing fluorescent host and dopant. 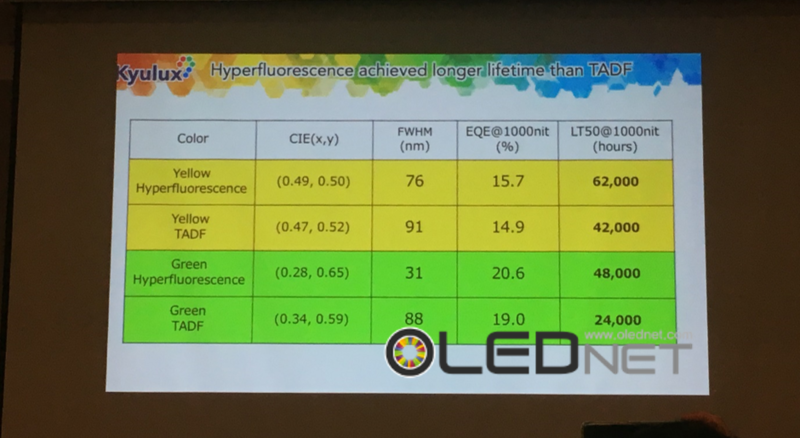 The color coordinates of the yellow hyperfluorescence revealed by Junji Adachi are (0.49, 0.50), the FWHM (Full Width at Half Maximum) is 76 nm, the EQE is 15.7% on 1000 nit basis, and the LT50 is 62,000 hours by 1000 nit. And the color coordinates of the green hyperfluorescence are (0.28, 0.65), the FWHM (Full Width at Half Maximum) is 31 nm, the EQE is 20.6% on 1000 nit basis, and the LT50 of 1,000 nit is 48,000 hours. Junji Adachi also revealed the performance of Blue hyperfluorescence, which is currently under development. The maximum emission wavelength of the blue hyperfluorescence is 470 nm, the EQE at 1000 nit is 22%, and the LT50 at 750 nit is 100 hours. 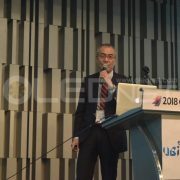 In particular, he predicted that the performance of Blue hyperfluorescence would be further improved in the future, saying that it began to improve rapidly in the first half of 2018. Fluorescent blue is currently used for the Blue of all OLED applications. Attention is growing whether Blue TADF or Blue Fluorescence can be commercialized to realize better efficiency and lifetime than existing fluorescent blue. http://olednet.com/wp-content/uploads/2018/09/kyulux1.png 515 940 Daejeong YOON /wp-content/uploads/2015/09/logo_oled.png Daejeong YOON2018-09-11 09:29:432018-09-25 21:07:36[IMID 2018] Can Blue TADF and Hyperfluorescence meet both efficiency and lifetime? 8월 31일 부산 BEXCO에서 열리고 있는 IMID 2018에서 Kyulux의 CEO, Junji Adachi는 기존의 형광재료 host와 dopant에 TADF dopant를 첨가하는 hyperfluorescence의 성능들을 공개했다. Junji Adachi가 공개한 노란색 hyperfluorescence의 색좌표는 (0.49,0.50), 반치폭은 76 nm, 1,000 nit 기준 EQE는 15.7%, 1000 nit 기준 LT50은 6만 2천시간이며, 녹색 hyperfluorescence의 색좌표는 (0.28,0.65), 반치폭은 31 nm, 1000 nit 기준 EQE는 20.6%, 1,000 nit 기준 LT50은 4만 8천시간이다. 이 자리에서 Junji Adachi는 현재 개발 중인 청색 hyperfluorescence의 성능도 공개했는데, 최대 발광 파장은 470 nm, 1000 nit 기준 EQE는 22%, 750 nit 기준 LT50은 100시간이라고 밝혔다. 특히, 2018년 상반기부터 청색 hyperfluorescence의 성능이 빠른 속도로 향상되기 시작했다며 앞으로 성능이 더욱 더 향상 될 것으로 기대했다. 이어진 발표에서 CYNORA의 Dr. Georgios Liaptsis는 현재 개발 중인 진한 청색(deep blue)을 설명하며 파장은 460 nm, CIEy는 0.15 이내가 되야 한다고 강조했다. 연한 청색(sky blue)로 갈수록 수명이 길어지는 특징이 있는데, CYNORA는 진한 청색으로 연한 청색만큼의 수명을 가질 수 있도록 연구를 진행하고 있다고 설명하며 성능을 공개했다. 현재 모든 OLED application의 청색은 형광 청색이 사용되고 있다. 청색 TADF나 청색 hyperfluorescence가 상용화 되어 기존의 형광 청색보다 더 개선 된 효율과 수명을 보여줄 수 있을지 귀추가 주목된다. Next-generation emitting materials, development is under way. 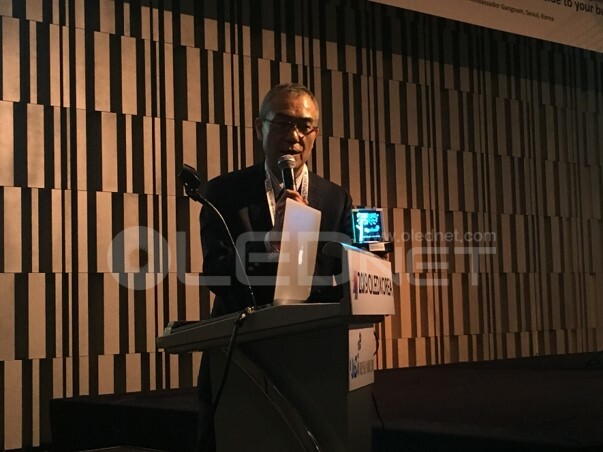 At the 4th OLED KOREA CONFERENCE, Kyulux and CYNORA, the leaders in the development of next generation emitting materials, announced the results of research and future development directions. 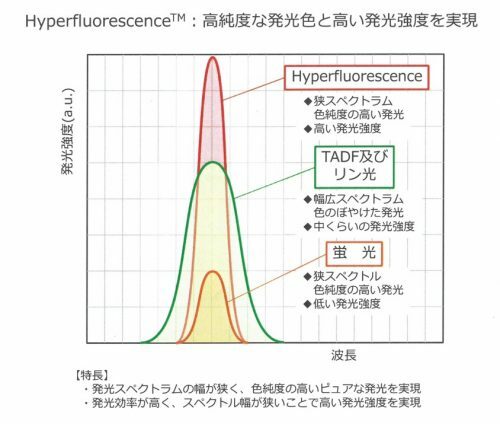 Junji Adachi, CEO of Kyulux, said, “We are developing Hyperfluorescence in the form of adding a TADF dopant to the existing fluorescent host and dopant.” He also emphasized that the emission FWHM (full width at half maximum) of Hyperfluorescence is about 35% of that of TADF, and the luminance is about twice as high, and this material can solve the drawbacks of TADF (wide FWHM and low luminance) at the same time. The latest Hyperfluorescence, which Jundi Arachi introduced, has efficiencies of red 28 cd /A, yellow 43 cd/A, green 81 cd / A, and life span is 10,000 hours, 62,000 hours, and 48,000 hours based on LT50 (1000nit) respectively. The color coordinates are red (0.64, 0.36), yellow (0.46, 0.52), and green (0.28, 0.65). 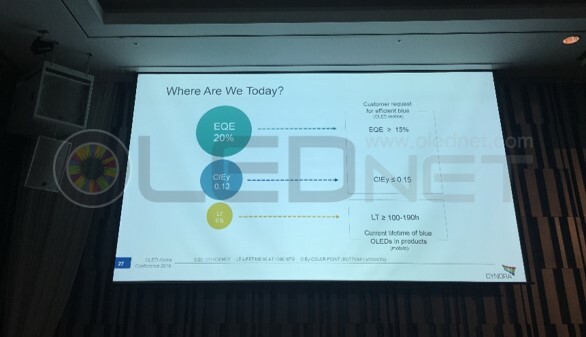 Andreas Haldi, CYNORA’s Chief Marketing Officer of CYNORA, said that the blue TADF emitter developed by CYNORA now has a color coordinate of 0.16, EQE of 24% and 10-hour lifetime (LT97 @ 700nit). 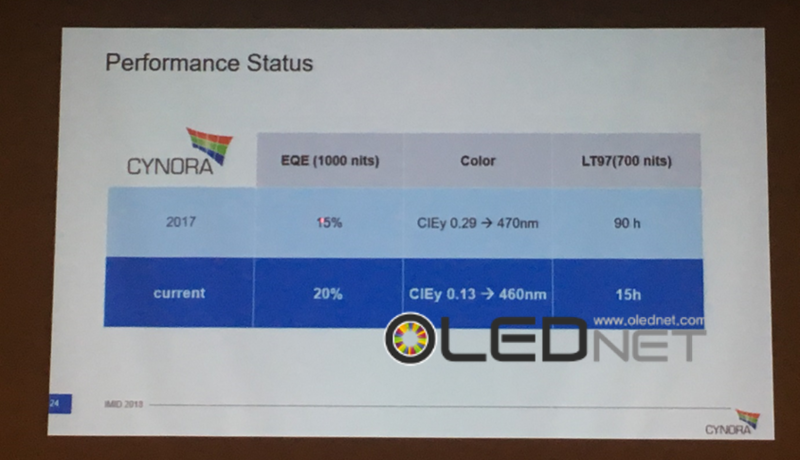 The performance is more than twice as efficient as the blue material currently used in OLEDs, and the color coordinates (0.10) are similar but the lifespan is short. He added that the Blue TADF emitter is scheduled to be developed within 2018 and will be available for mass production in 2019. 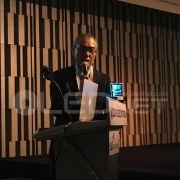 He also mentioned that the manufacturing cost is reduced and the power consumption is reduced, thereby minimizing battery consumption if blue TADF emitters with high efficiency are used instead of conventional low-efficiency blue materials. At the same time, it is expected to be able to improve the resolution of OLEDs and be applied to large-scale vacuum processing lines of major panel makers. According to CYNORA, next step is to develop green TADF emitters (2019) and red emitters (2020) after finishing the development of blue TADF emitters (2018). Thus, it might be completed ‘RGB TADF emitter development’ by 2020.
http://olednet.com/wp-content/uploads/2018/03/Kyulux.jpg 626 940 OLEDNET /wp-content/uploads/2015/09/logo_oled.png OLEDNET2018-03-16 17:09:222018-09-25 22:11:34Next-generation emitting materials, development is under way. 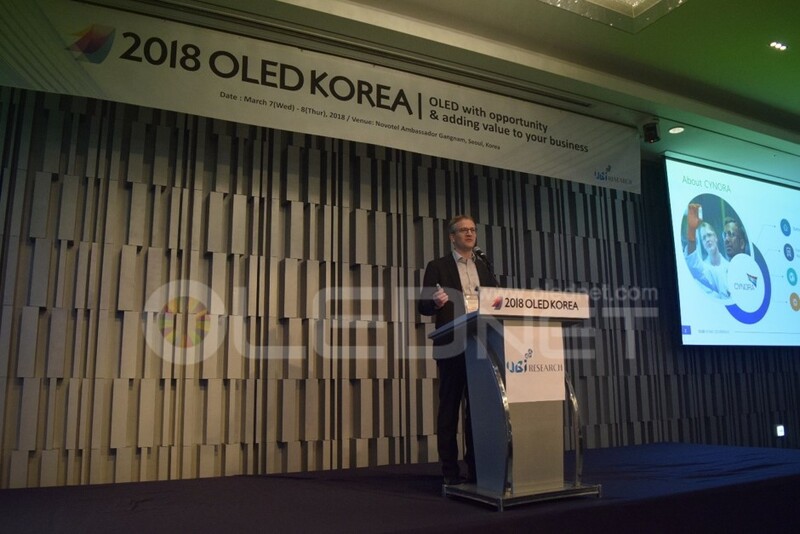 2018 OLED KOREA CONFERENCE에서 차세대 발광재료 개발 선두 주자인 Kyulux와 CYNORA가 연구결과와 앞으로의 개발방향을 발표하였다. Kyulux의 CEO, Junji Adachi는 ‘기존의 형광재료 host와 dopant에 TADF dopant를 첨가하는 형태의 hyperfluorescence를 개발하고 있다’고 설명했다. hyperfluorescence의 발광 반치폭은 TADF의 약 35% 수준이며, 휘도는 약 2배이상이며, 이 재료가 TADF가 가진 단점(넓은 반치폭과 낮은 휘도 등)을 동시에 해결할 수 있다고 강조했다. Junji Adachi가 공개한 최신 hyperfluorescence의 효율은 red 28 cd/A, yellow 43 cd/A, green 81 cd/A이며, 수명은 LT50(1000nit)기준 10,000시간, 62,000시간, 48,000시간이다. 색좌표는 red (0.64,0.36), yellow(0.46, 0.52), green(0.28, 0.65)이다. 한편, CYNORA의 chief marketing officer, Andreas Haldi는 현재 CYNORA가 개발한 blue TADF emitter의 색좌표는 0.16, EQE는 24%, 수명(LT97@700nit)은 10시간이라 밝혔다. 이러한 성능은 현재 OLED에 사용되는 blue 재료보다 효율은 2배 이상 높으며, 색좌표(0.10)는 비슷한 수준이나, 수명은 부족하다고 설명하였다. Blue TADF emitter는 2018년 개발이 완료되어 2019년 양산에 적용될 것이다고 덧붙였다. 또한, 기존의 낮은 효율을 갖는 재료 대신 고효율의 blue TADF emitter를 사용한다면, 제조단가가 감소할 뿐만 아니라 소비전력이 감소되어 배터리 소모를 최소화 할 수 있다고 말했다. 동시에 OLED의 해상도를 향상시킬 수 있어 주요 panel 업체의 대규모 진공 공정 라인에 적용될 수 있을 것으로 기대된다고 언급했다. CYNORA는 blue TADF emitter가 개발 완료(2018)된 후, green TADF emitter, red TADF emitter 순으로 개발, 2020년까지 RGB TADF emitter 개발을 완료할 예정이다. Thermally activated delayed fluorescence(TADF), still under development to complement OLED emitting materials insufficient as both fluorescence and phosphorescent materials, takes time to be commercialized at the present stage. Even Kyulux considered the most advanced company in terms of TADF technology hasn’t yet to commercialized TADF dopant suitable for display. 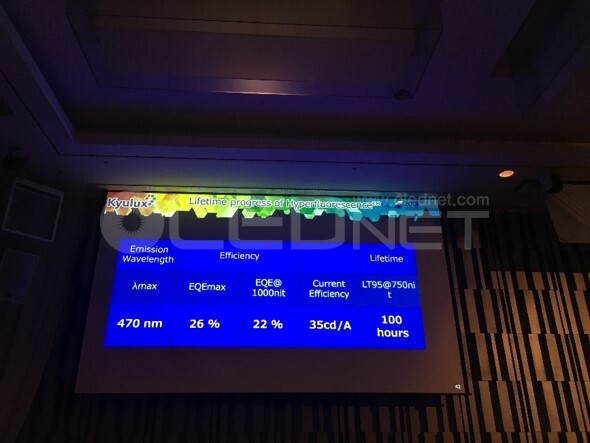 Adachi, CTO of Kyulux said the unprepared TADF host material is an obstacle to the commercialization of TADF, so the full width at half maximum of emitting peak is too wide to be applied to display. To solve this problem, the 4th generation hyperfluorescence is under development to commercialize the TADF material. Hyperfluorescence aims at having the effect of a phosphorescent material by adding TADF dopant to existing fluorescence host and dopant. 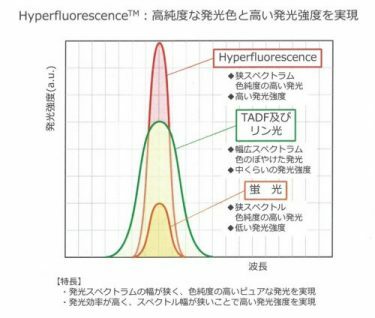 This effect has a structure that can solve both the full width at half maximum of TADF and the low brightness of fluorescence materials as seen in the above figure, Adachi emphasized. 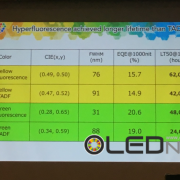 As seen in the above photo, Kyulux’s OLED made of general green fluorescence material and OLED made of hyperfluorescence by adding TADF to this material have a distinct difference on the same substrate. Kyulux’s goal is to commercialize hyper fluorescence by 2017. Its target is PMOLED. 형광재료로서도 인광재료로서도 부족한 OLED 발광재료 특성을 보완하기 위해 개발중인 지연형광(TADF, thermally activated delayed fluorescence) 역시 현 단계에서는 상용화에 시간이 걸리고 있다. TADF 기술에서 가장 앞서 있는 기업으로 평가 받고 있는 Kyulux에서도 디스플레이에 적합한 TADF dopant 상용화에 도달하지 못하고 있기 때문이다. Kyulux의 CTO인 Adachi씨에 의하면 TADF 상용화에 걸림돌은 TADF 전용 호스트 재료가 아직 준비되어 있지 않아 발광피크의 반가폭이 넓어 디스플레이에 적합하지 않기 때문이라고 언급했다. Kyulux가 이러한 문제점을 해결하여 TADF 재료 상용화에 돌입하기 위해 개발중인 재료가 4세대 발광재료인 hyperfluorescence이다. Hyperfluorescence 재료는 기존 형광재료 호스트와 도판트에 TADF 도판트를 첨가하여 형광재료로서 인광재료의 효과를 발휘하는 것을 목표로 하고 있다. 이 효과는 상기 그림에서처럼 TADF가 가진 넓은 반가폭과 형광 재료의 낮은 휘도를 동시에 해결할 수 있는 구조임을 Adachi씨는 강조했다. Kyulux에서 일반적인 녹색 형광재료를 사용하여 제작한 OLED와 이 재료에 TADF를 첨가하여 hyperfluorescence 구조로 만든 OLED를 동일 기판에 만든 상기 사진에서 확연히 두가지 종류와의 발광 차이점은 나타났다. Kyulux의 hyperfluorescence 재료 상용화 목표는 2017년 내로 설정하고 있다. 타겟은 PMOLED이다.